We are now coming to the end of the tomato season in the garden. I love not having to buy tomatoes for weeks on end, and I especially love that virtually every bite of tomato over that time is full of delicious, rich flavour. We’ve discovered that growing tomatoes outside in Britain, means growing cherry tomatoes if you want to be sure of them ripening. Don’t get me wrong, I love green tomato chutney and even fried green tomatoes, but nothing beats the taste of ripe red tomato fresh off the vine. However, we had so many tomatoes this year, that it became necessary to find some way of storing them for less abundant times, and one of my favourites is Slow Roast Tomatoes, topped with olive oil and stored in jars. I’m not providing measurements with this recipe, as it depends on how many tomatoes you have, but I was using about 3lb. Pre-heat the oven on a very low setting 140C/275F/gas mark 1. 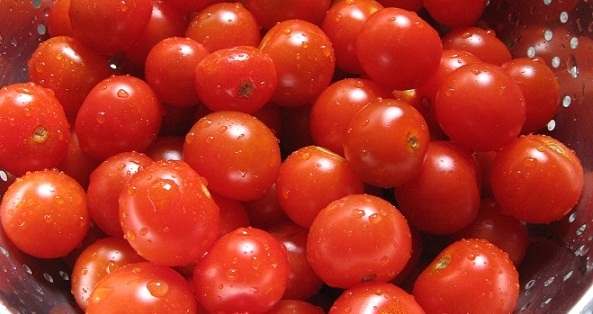 If using cherry tomatoes, pierce a hole in the skin, or cut larger tomatoes in half or into quarters. 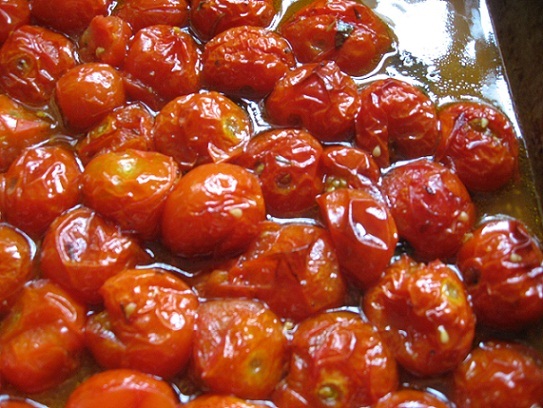 Place all the tomatoes onto a large roasting pan and pour over enough olive oil to coat them. Sprinkle with the herbs, sugar and salt and pepper and stir around to mix. Place in the oven for 3-4 hours. You can cook the tomatoes at a slightly higher temperature for a shorter time, but the slower roasting really brings out the flavour. Also I like to raise the heat for the last half hour of cooking. To store the tomatoes, wash some jars and put them in the oven to sterilise for at least ten minutes. 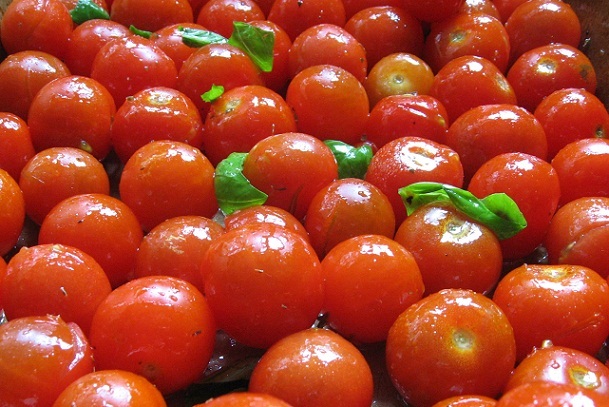 Take them out and put 1 – 2 tablespoons of lemon juice in each jar to preserve the tomatoes. Add the tomatoes when they have finished cooking and add more oil so that the tomatoes are completely covered. Put the lid on tightly and store in a cool, dark place. These make a wonderful pasta sauce, a delicious addition to a salad, or served as an alternative to ketchup with burgers! We are currently in the middle of British Food Fortnight, which goes on until 3rd October. The idea of the festival is to celebrate eating local, seasonal food, whilst encouraging shops and restaurants to think about where they produce comes from. There are going to be special events at Harrods, John Lewis, St Pancras train station and St Paul’s Cathedral. The National Trust is joining in the extravaganza, with events all over the country. There’s a Food and Craft Festival in Beningbrough Hall, N. Yorkshire (25-26th September), a Peppers Day in Clumber Park, Nottinghamshire (25th Sept) and an Apple Festival in Erddig, Wrexham (2-3rd Oct), among others. 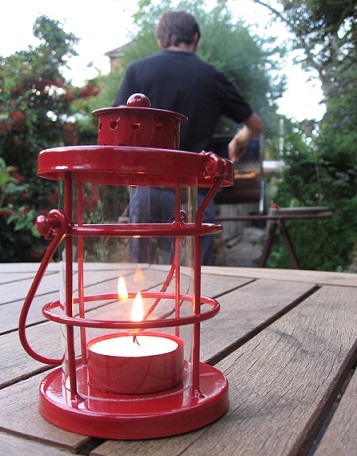 This weekend saw us celebrating possibly the last barbecue of the season. It was a lovely warm day and evening and so, on the spur of the moment we decided we had the ingredients and that we’d give it a go! al fresco dining is more fun! Now, most people I know are horrified at the thought of having to invite a vegetarian to their bbq So used are they to the event being a meat-fest with a little coleslaw on the side, that they can’t imagine what they’ll cook. But a couple of bbq stories first. Number one: I attended a barbecue once where the hosts scrupulously bought veggie burgers for us, then cooked them and dished them first so that they wouldn’t be ‘contaminated’ before moving on to the frozen meat burgers they’d bought. It was only later as they cleared up that they realised the ‘meat’ burgers had in fact been Linda McCartney veggie burgers and no one had noticed! Number two: I was part of a large bbq party and brought along a portable bbq for the veggie stuff, which we duly lit in a quiet corner. But our selection of flame roast veggies was so popular with the meat eaters that we had to start hiding the stuff away to save any for ourselves! Anyway, on to last night and what cornucopia did we manage to rustle up? Here’s the list, and I urge everyone to add the veggie options to their bbq’s to liven things up a little. 2. Char-grilled haloumi. Haloumi is perfect cooked on the barbie, salty, chewy and moist. 3. Sweet potato wedges. Slice sweet potato into wedges, brush with olive oil. Cook on the bbq for around 10 mins wrapped in tin foil, then place directly on the grill to brown. 4. Corn on the cob. 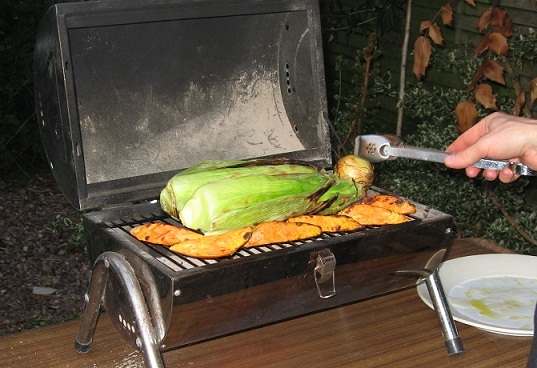 Leave the corn wrapped in their leaves, soak in water for about 10 mins, then pop directly on the grill. Cook for around 20 mins, then enjoy getting the burnt leaves all over the garden as you peel them off! 5. Char-grilled onion. Leave the onions whole in their skins and cook as corn above. 6. Grilled potatoes. We had some whole boiled potatoes left over and they were perfect just popped straight on to the grill for a few minutes while they brown. Serve everything with some sweetcorn and chilli relish or your favourite bbq sauce and a nice green salad. Does life get any better? On a recent holiday in Wales, I came across a couple of local community businesses that are both very good at what they do, and perhaps show a way forward for anyone wanting to re-connect with their community, their environment and their food supply. Both of these businesses are well off the beaten track and so I presume serve a relatively small number of people, although both appeared pretty well used while I was there. If you happen to be passing somewhere near by, why not try and find them! The Gower Wildflower and Local Produce Centre is hidden away in the back lanes of the Gower Peninsula in South Wales. The centre has a lovely wildflower garden with boards naming and describing the flowers, as well as a garden centre, shop and cafe. The garden centre specialises in local wildflower, bog and pond plants and sells compost made from the local bracken. The shop and cafe meanwhile, stock local arts and crafts as well as local cheeses, vegetables, chutneys, veggie pies and other local foods. Salads served in the cafe contain their home grown tomatoes and herbs. The Brockweir and Hewelsfield Village Shop and Cafe was opened after the general stores in the two villages of Brockweir and Hewelsfield in the Wye Valley closed down, and the local community felt they needed the services of a local place to meet, shop and carry out business. The shop also provides certain postal services and acts as an informal lending library. The upper floor of the building provides IT facillities and training. The shop and cafe are run by a manager with the help of a string of around 40 volunteers, keeping the business open 7 days a week. The building itself is also a triumph. As well as being light, airy and a pleasure to use, it has been built and is run with a keen environmental awareness, and is lit and heated with solar and heat pump energy. The shop sells environment-friendly cleaning products and local food. The cafe also makes use of local suppliers and provides a space for local artists to exhibit their work. I loved the place, and as another new Tesco opens up just round the corner from me, I have to say that I feel just a little bit jealous!